I really like cauliflower. I don’t mind how it is prepared and served (except of course if boiled down to mush). One of my favourite ways of preparing it is by roasting it with some spices. Again, an idea taken from Jamie Oliver, it’s just a slightly different way of cooking the cauliflower to make it taste amazing and still keeping it healthy. Part of the process is bashing some spices together with a pestle and mortar. If you don’t have one, just place the spices in a ziplock bag and use the base of a coffee mug or something heavy to crush the spices. 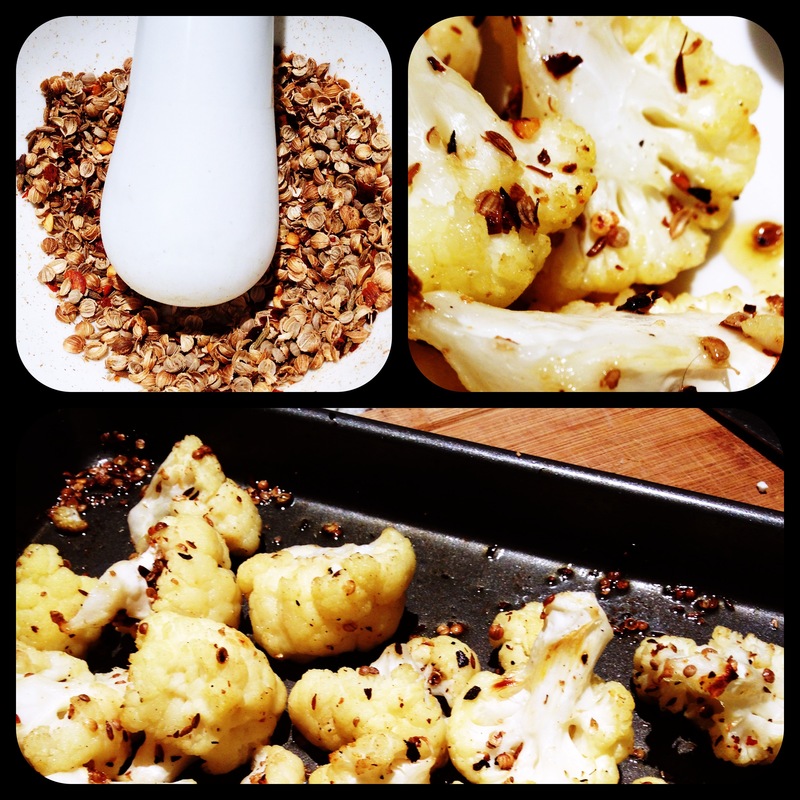 Cut the cauliflower up and blanch in a pot of boiling water for approximately 4 minutes. Drain and set aside. In a pestle and mortar bash together the coriander seeds, cumin seeds and chilli flakes. Pour the spices into the roasting tin you are going to use, and place the roasting tin on the stove over a high heat to dry roast the spices for a few minutes. This helps release all the delicious flavour of the spices. Add a good glug of olive oil and a knob of butter, as well us the cauliflower and toss it all together until the cauliflower is coated in the spices. Season with salt and pepper. Roast in the oven for approximately 15 minutes and serve immediately. That’s a new way to prepare it. I’ve never done it like that before. I’ll have to try that or something similar. Haha I love how you have Savoury Sundays and on my blog I do a Sunday Sweets!